Judging someone’s character can be boiled down to this key question: do they love going to the dump? An affirmative answer indicates a visionary – one who sees a fashionably distressed dining set where others see a worn out table and chairs. One who sees the south wall of their new chicken coop where others see dusty old windows. One who sees his new (free) rolling shop stool where others see a ratty office chair. 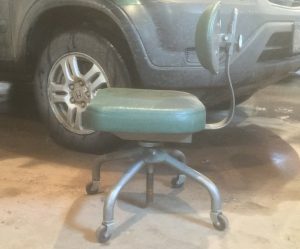 Why drop $50 on a shop stool when you can get a sweet unit like this free at the dump? So, while I salivate at adding a lawnmower, snowblower or other piece of equipment from the dump to my family fleet, I also burn with shame toward my fellow man for discarding something that might have been easily repaired. 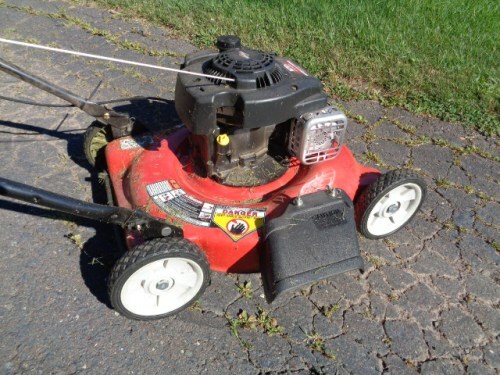 One of the biggest reasons people junk their lawnmower, string trimmer, chainsaw or other equipment is because it starts hard and runs rough. A dirty carburetor is often to blame. 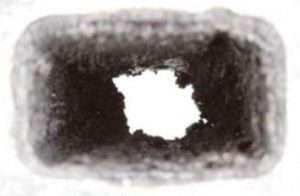 Over time, oxygen deteriorates the gasoline in the carb, leading to the formation of varnish and other deposits that stick the float, block the screens and plug the tiny fuel passages. The result? Fuel that doesn’t flow properly and an arm nearly ripped from its socket from fruitlessly yanking the starter cord. The combustion chamber grows intensely hot during operation. The heat breaks down motor oil, creating carbon that can lodge in the ring lands and cause the piston rings to stick. Stuck rings reduce engine compression, which makes starting more difficult and reduces engine power. Gasoline byproducts can form deposits on the piston crown, which can lead to pre-ignition. That’s when a super-heated chunk of carbon ignites the fuel/air mixture before the spark plug fires, causing a shock wave in the cylinder that can lead to piston damage. In two-stroke engines, deposits can block the exhaust port or spark arrestor screen, choking off airflow and leading to rough-running. If bad enough, the engine will quit running altogether. String trimmer exhaust port plugged with carbon deposits, causing it to run poorly. An effective way to prevent hard-starting, rough-running equipment is to treat gas with gasoline stabilizer prior to storage and to periodically clean the carburetor and combustion chamber with a good fuel additive. Otherwise, you’ll find yourself at the dump paying to dispose of your lawnmower, snowblower or other equipment while people like me lie in wait, rubbing our hands together with glee. It will not damage seals, gaskets, rubber or plastic materials commonly used in gasoline engines. I’ve tried it a few times on my lawn and garden equipment, and it’s pretty simple to use. Just run the engine to normal operating temperature, remove the air filter and spray Power Foam into the intake as fast as possible without stalling the engine. You may have to rev the engine to facilitate the process. Make sure you’re in a well-ventilated area because an impressive volume of smoke will emit from the exhaust. Then, shut off the engine and let it sit for 10-15 minutes. While you’re waiting, Power Foam‘s potent formula attacks and loosens the built-up carbon and varnish, helping free stuck rings, clean the valves and piston crown, and remove varnish from the carburetor. If the engine is especially dirty, you may want to repeat the process. Replace the air filter, start the engine and pat yourself on the back for helping prevent the addition of one more perfectly usable piece of equipment to the local dump. It may be unfortunate for scavengers like me, but it’s great for your wallet. And here’s another Sioux Falls secrete for you lawn care customers!! A frequent weedeater problem easy to repair.